First United Methodist Church of Austin > New Here? Welcome to First United Methodist Church of Austin. We are glad that you have come our way, and we pray that we might be a blessing in your life. Justice. Working to eradicate injustice for the excluded and marginalized. Bridge-Building. Nurturing multigenerational friendships and community partnerships. Storytelling. Sharing our stories of faith and of growth. Active Learning. Pursuing knowledge and understanding of God. Service. Seeking mutually empowering service opportunities. Constructive Disruption. Disrupting systems of power to create positive change. When are FUMC’s worship times? This intimate, 50-minute service blends a traditional order of worship with an informal approach. Rev. 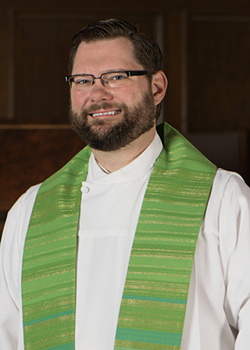 Taylor Fuerst is the principal preacher and worship is centered on Scripture, drawing together contemporary issues and the best of United Methodist tradition. Both traditional hymns and newer songs are sung by a variety of vocal ensembles, accompanied by piano and violin. The Sacrament of Holy Communion is celebrated each week. This larger, traditional service lasts about 60 minutes. Music is led by our talented FUMC choir and organist featuring traditional church hymns and a variety of musical offerings. Rev. 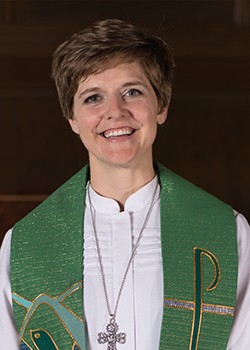 Taylor Fuerst is the principal preacher for this service and leads a time for young disciples, when children can join her at the altar to learn about our Christian faith. The Sacrament of Holy Communion is celebrated on the first Sunday of the month. Each Thursday at 6:30 AM, following the Breakfast for the Homeless, the Rev. Cathy Stone leads on informal worship service in Garrison Chapel of the Family Life Center. This worship experience is specifically designed to be relevant to our neighbors on the street and to those involved in issues of urban poverty and homelessness. 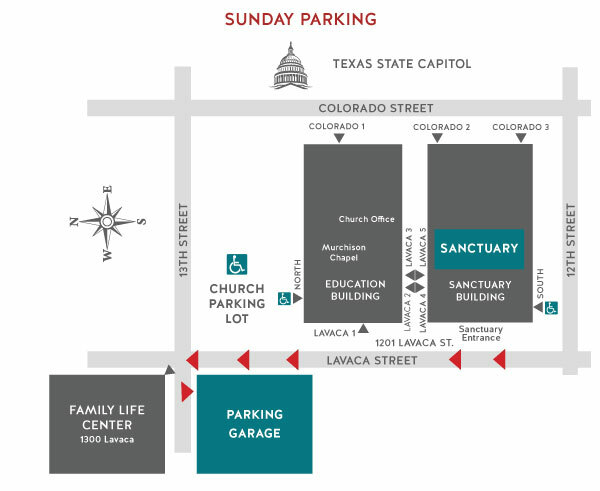 First United Methodist Church is located on the northeast corner of Lavaca Street & 12th Street, on the west side of the Capitol in downtown Austin. 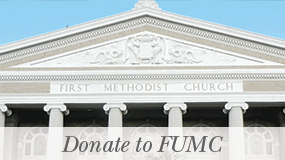 The FUMC Family Life Center is located across the street diagonally from the church, on the northwest corner of Lavaca Street and 13th Street. Our address is 1201 Lavaca Street Austin, TX 78701. To learn more visit Driving and Parking. Children of any age are welcome to participate in all our worship services. For families with infants and toddlers, we know that parents sometimes prefer to worship with their children safe and happily engaged in our childcare rooms. Childcare is available during worship services for infants and children up to age 5. All childcare rooms are located in the Children’s Wing on the 1st Floor of the Education Building. For those who wish to remain close to their infants and toddlers, a Family Room, furnished with rocking chairs, toddler toys, and a changing table, is available behind the sanctuary balcony. Large windows and speakers provide access to the service. When children reach about four or five and they are ready, we encourage parents to begin bringing them to worship on a regular basis. To learn more about children’s Sunday School classes, visit Children’s Sunday School. We have a diversified education program with both weekly and special learning experiences for all ages. Sunday School for all ages begins at 10:00 a.m. 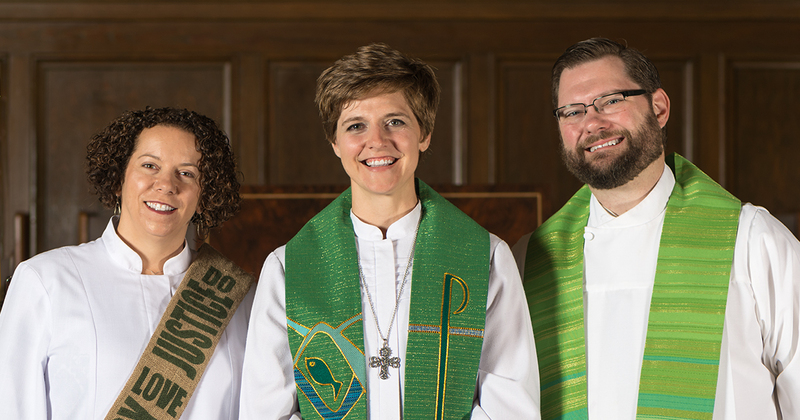 Does FUMC follow a dress code? FUMC has traditional worship in our Sanctuary and a Chapel service on 3rd Sundays in our Chapel. All services are casual in nature. Members will range from a collared shirt and jeans to business casual. Our church body is diverse and our attire is varied. Come as you are. Our offices are open Monday through Wednesday, 9:00 a.m. to 5:00 p.m. (closed 12:00-1:00 p.m. for lunch), Thursday 9:00 a.m. to 3:00 p.m. and Sunday mornings, 9:00 to 11:00 a.m.
To learn more, visit Who To Contact and FAQ. To learn more, visit How to Join. 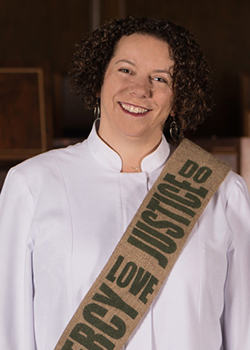 Reverend Taylor Fuerst leads our worship for the 9 a.m. and 11 a.m. Sanctuary service. Our chapel services are led by lay leaders.